1. Complying with ISO standard. Quality Ensured. 2. Complete Inspection for each unit before out of factory, covering water system and electricity detection and testing, ensuring 100% right product before shipment. 3. Strict quality control during production. We have liquid soap detection, halogen detection, electrical detection and water-soaking detection during production to avoid gas leakage and electrical problems. 4. Full inspection on bigger parts such as compressors, condensers, evaporators, expansion valves, flow switches, controllers etc. Selection inspection for small parts such as sensors, pressure switches etc. 5. Well noise control by using mute cotton for casing plates and soft rubber feet for floating compressors, some of the models use compressor isolation shields. 6. Well insulated with insulated cotton for every pipe and parts, include compressor, dryer filter and each pipes. 7. We have passed TUV and SGS inspections. We have CE, Ro HS, IEC, CCC, CB certificates for most of our products. Some of our products have en14511 test, en14825 test. 2. We supply you the professional refrigeration technical support and electronic technical support for your installation, debugging and operation. Spare parts and technical support at most economic prices after the warranty. Q1. 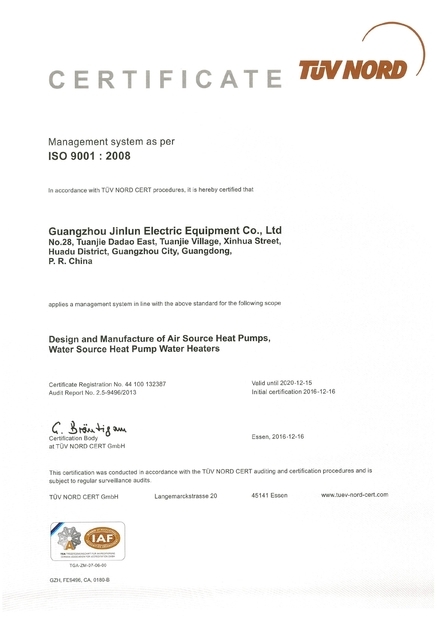 Can I have a sample order for Heat pump or Water tank? A: Sample needs 3-10days, mass production time depend on the products' quantity. A: Yes, 12 months since the heat pump depart from the port of loading (Refer to the Bill of Lading). 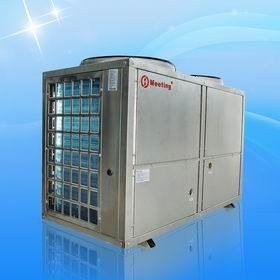 Air to water heat pump, DC inverter heat pump, High water temperature heat pump. 1).We were established in 2001. 4). Our company has been inspected and certificated by TUV and SGS. 5). We are the one of the first manufacturers whose heat pumps are with top COP gaining grants from Chinese government. 7). Our testing laboratory can test heat pump up to 60KW heating capacity and create testing air temperature condition during -25DegC~45DegC,according to EN14511 standard.